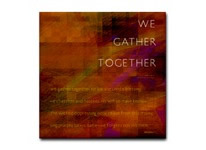 the origins of “We Gather Together” are rooted in Dutch history, but its lyrics have withstood the test of time to become an heirloom American Thanksgiving hymn. Like its companion artwork, “Now Thank We All Our God,” this piece is a digital quilt sewn with vivid hues that play with traditional autumn colors. thy name be ever prais’d! O Lord, make us free!